Hi Alex, I have made a macro to update stock file. STEP 1: click the button (Picture 1). The macro will run and ask you to choose the latest stock file as seen in Picture 2 (STEP 2: Choose the file). After that the macro will update the stoc k file with the latest stock file. The result can be seen in Picture 3 and Picture 4. Kindly please your feedback. Thank you. There are some new shops that exists in the latest file but not in the previous file, vice versa. 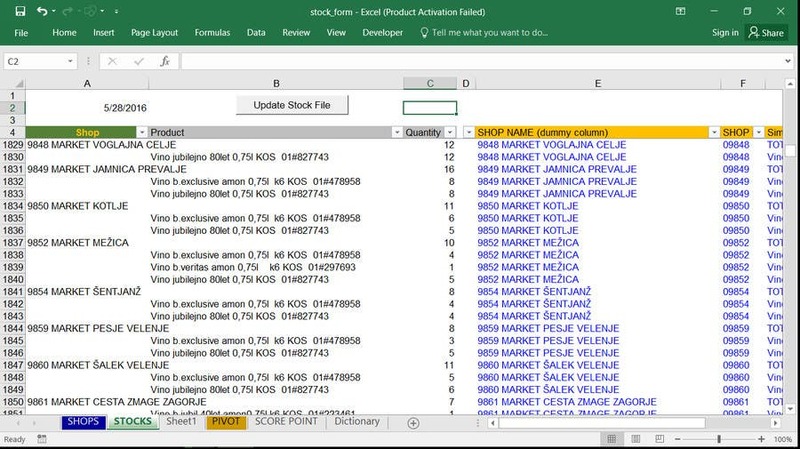 The current macro that I made is keep the order of SHOP and ITEM/PRODUCT based on the latest file (stock-11_07_2016.xls). For illustration, please see picture 5 , the current macro I use is Macro Result 1.